For more information, or to schedule a visit, contact JABA's Main Office at 434.817.5222 or info@jabacares.org. Are you looking for a place to gather resource information, meet new friends, get involved in activities, or enjoy day trips? You have found the place. JABA serves the daily needs of the aging community, their families and caregivers through JABA's Community Senior Centers. Each center also offers a hot, healthy lunch, member only free health screenings, and the opportunity to volunteer. Centers are located in Charlottesville, Scottsville, Esmont, Fluvanna County, Greene County, Louisa County, and Nelson County. View our Centers Gallery below! What is this? The JABA Community Senior Center programs offer a diverse schedule of activities, exercise, socialization, health screenings, volunteer opportunities and lunch. These programs are geared towards individuals 60 and above. However, opportunities to become engaged are available to all ages. Who can attend? An individual must be fully independent, manage their own medications and personal care and able to actively participate in activities. Caregivers are expected to attend along with individuals who require personal assistance. How do you join? Make an appointment with a Center Manager to attend the center one day as a visitor to try us out. Once a visit takes place and an individual decides to join, an appointment is scheduled for our intake process, which includes a screening by our nurse and completion of paperwork. At that appointment we will discuss the attendance schedule and all the details. Is there a cost? There is no cost to join as a member and attend. However each day members are asked to contribute a donation toward lunch. The suggested donation is $3.00 per day. There may also be optional field trips or special activities that have a fee. 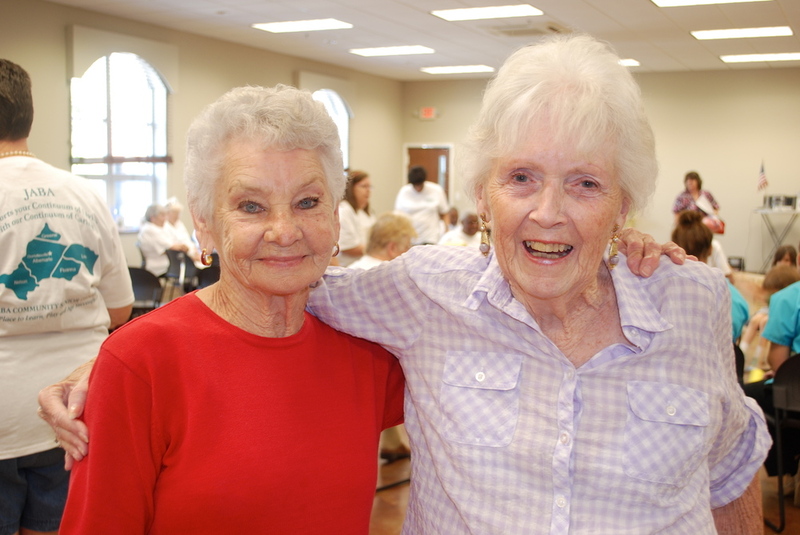 Since 1975, the Jefferson Area Board for Aging, JABA, has been serving the needs of the aging community in the Thomas Jefferson Planning district (the city of Charlottesville and the counties of Albemarle, Fluvanna, Greene, Louisa and Nelson). Through the years, from our roots as a federally mandated Area Agency on Aging to our current position as one of the most innovative and successful aging organizations, JABA has never lost focus of the needs and desires of the community. Working with state and local government, educational institutions, private citizens of all ages, businesses, and other nonprofit organizations, JABA has consistently risen to the challenge of its mission: to promote, establish and preserve communities for healthy aging that benefit individuals and families of all ages. Keep up-to-date on the latest news and trends in aging, as well as JABA news, events and service information by signing up for Continuum, our monthly e-newsletter!